The Association of Australian Convention Bureaux (AACB) is pleased to announce Newcastle Convention Bureau through Altogether Perfect as the winner of AACB’s Innovation Award for 2014/15. 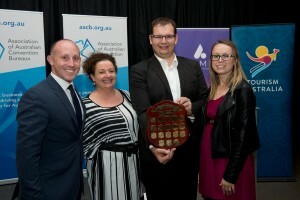 The award was announced during the AIME Gala Dinner at Tempus Two, Hunter Valley. The award recognises new innovations that represent a significant transformation to bureau operations, technology and/or to the product pipeline. Bureaux competing for the award gave a TEDx style presentation at the 26th AACB Staff Conference where voting was conducted by a combination of scores from competitor bureaux and independent judges. Each entrant highlighted specific benefits and organisational gains that have been realised from the innovation implemented and the impact it has on the business events industry and wider community. The ‘Altogether Perfect’ campaign was launched in 2014 as a collaborative marketing effort undertaken by regional partners in the broader Hunter Region to attract and secure business events tourism.